We used the GSN broadband waveforms downloaded from the IRIS DMC. 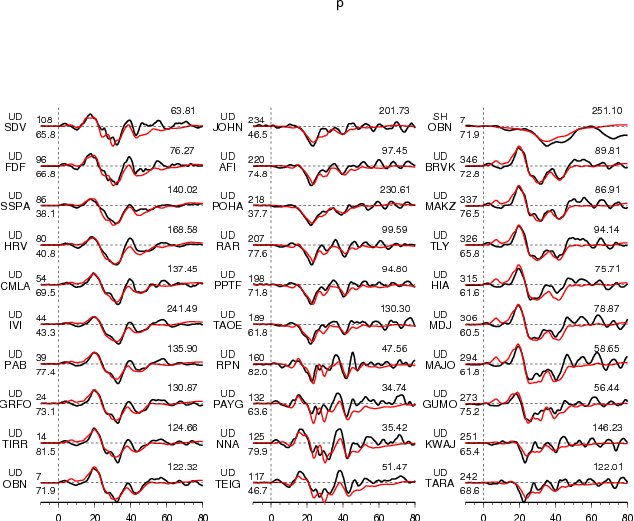 We analyzed 29 teleseismic broadband P waveforms, 25 broadband SH waveforms, and 59 long period surface waves selected based upon data quality and azimuthal distribution. 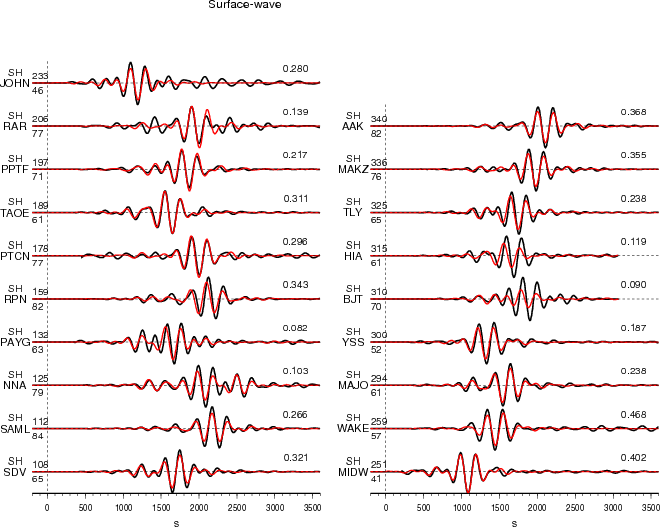 Waveforms are first converted to displacement by removing the instrument response and then used to constrain the slip history based on a finite fault inverse algorithm (Ji et al, 2002). We use the hypocenter of the USGS (Lon.=-131.9270 deg. ; Lat.=52.7690 deg.). The fault planes are defined using the quick moment tensor solution of the NEIC. After comparing the waveform fits based on two planes, we find that the nodal plane (strike=325.00 deg., dip=29.00 deg.) fits the data better. The seismic moment release based upon this plane is 0.496E+28 dyne.cm using a 1D crustal model interpolated from CRUST2.0 (Bassin et al., 2000). Figure 3.3. 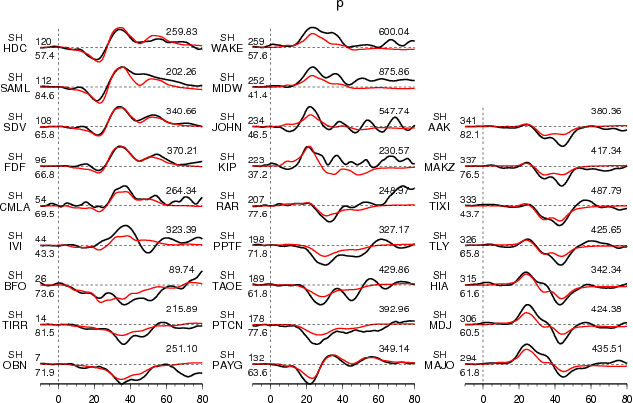 Comparison of long period surface waves. 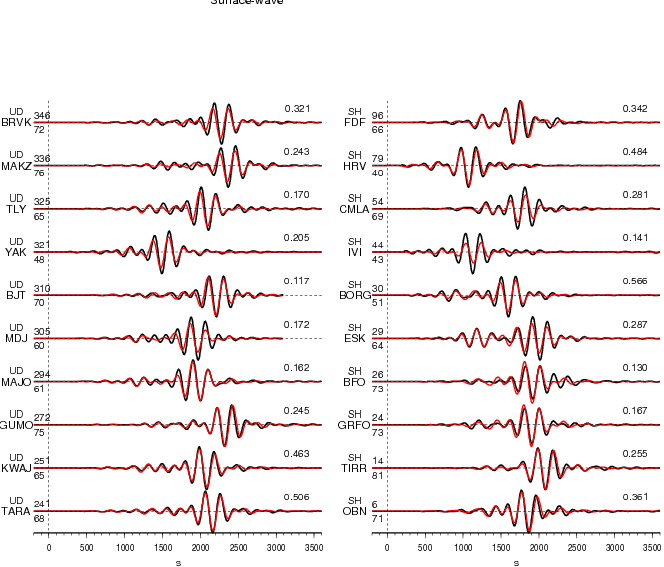 The data is shown in black and the synthetic seismograms are plotted in red. 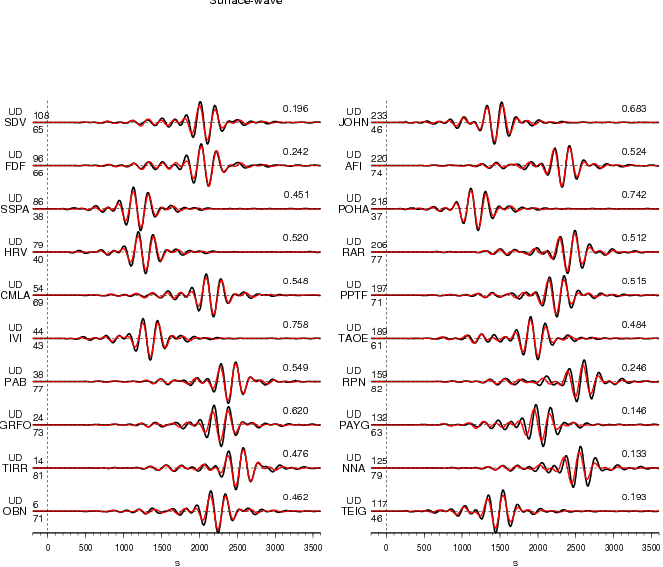 Both data and synthetic seismograms are aligned on the P or SH arrivals. 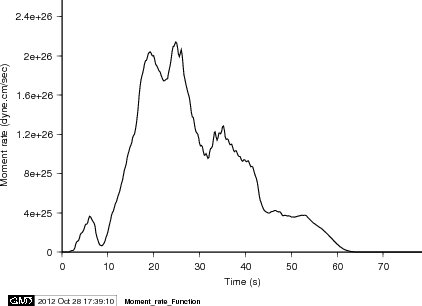 The number at the end of each trace is the peak amplitude of the observation in micro-meter. The number above the beginning of each trace is the source azimuth and below is the epicentral distance. Figure 4. 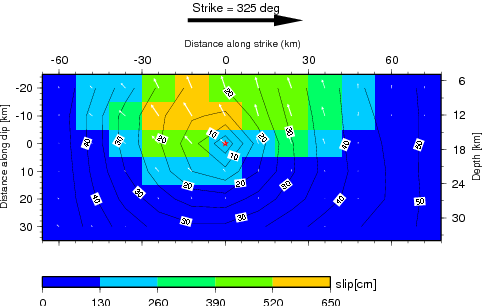 Surface projection of the slip distribution superimposed on ETOPO2. The black line indicates the major plate boundary [Bird, 2003]. The red dots are aftershocks in two days (NEIC USGS). Beach ball shows the focal mechanism of this earthquake based on GCMT solution. Solid red star indicates epicenter location of USGS PDE solution and open red star denotes the epicenter of the NRC (Natural Resources Canada) solution. Our inversion results are relative to the earthquake hypocenter. 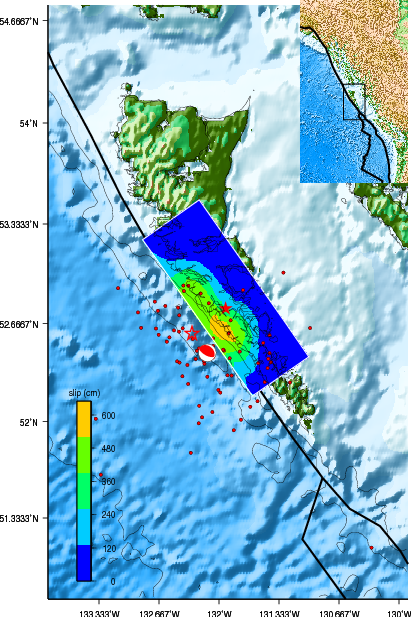 If the mainshock hypocenter is located in SW of the USGS location, the slip distribution will also shift to the SW by the same amount.